So far, 2008 has been a thrill ride of the worst kind: The Dow has given back nearly all its gains for the last two years, housing prices and sales continue dropping with "no sign of a bottom" (per S&P spokesman David M. Blitzer, quoted in Housing prices post record declines at CNNMoney.com), prices for food and other consumables are rising, "legions" of the newly-homeless are living in their cars or RVs, and oil is over $140/barrel, after hitting $100 for the first time on January 3 and then declining briefly to near $80. Gasoline has now been over $4/gal for some time, which is killing Detroit . Full-size trucks and SUVs, the cash cows of the American car biz, have become lepers on the car lots. High gas prices are also choking off what little disposable income still remains for the middle class. There is more: Massive flooding in Iowa has dashed any hope for a generous (or even average) corn crop this year, which means today's global food shortage and attendant price inflation will intensify instead of easing. An attack on Iran remains a concern, as the drumbeat for war in the Corporatist Media continues. Could such an attack double or even triple oil prices? Some think so (link is to transcript of a recent speech in the House by Ron Paul condemning the "virtual war resolution" soon to be considered by the House of Representatives; a link to video of the speech [5 min 33 sec] is also included). I could go on at length, because the past six months have seen a constant barrage of bad news. For a fuller (yet still brief) recap of the misery, here's Start of 2008 is the ugliest in decades by Kathleen Pender at SFGate.com ( June 29, 2008 ) which includes a table with details of the changes for economic and financial indicators since the start of the year. Number of those changes that look positive for the economy as a whole: zero. Is the trouble now behind us, or is more on the way? Is the glass half full, or about to shatter on the floor? Unhappily, Scenario Number Two appears the more likely. My guess is that trouble has moved in for an extended stay: what I call the Perma-Depression. The reasons for this prediction are appallingly clear, even if the Corporatist Media (especially in the U.S. ) and their status-quo cheerleaders often paint a rosier picture. The underlying fundamentals nearly all point in the same direction: down. Hard times lie ahead, and it will take more than a short business-cycle correction to bring back the easy prosperity Americans once took for granted. Far too much damage has been done to America since 1913 for a quick turnaround, and the policies being pushed by the Corporate Media and the Old Power Parties (as represented by Obama and McCain in particular) are just more of the same -- war with Iran or Pakistan or some other Target of the Month; bigger government generally; a takeover of the banks by the Fed; more restrictions on business and on personal liberty, and so on. FDR, Johnson, and every other anti-liberty, war-mongering, "guns and butter"-promising, pseudo-compassionate pol in American history would be proud. Such policies are guaranteed to make things worse; they always have. Indeed: such policies are what brought us to where we are today. This past Saturday, June 28, Fortis Bank announced that it expects "a complete collapse of the US financial markets within a few days to weeks." This collapse will include bankruptcy for 6,000 US banks and for Citigroup, General Motors, and other well-known corporations. "The situation in the US is much worse than we thought", says Fortis chairman Maurice Lippens. The expected response to all this financial carnage includes massive injections of money from the Fed and other central banks, in a desperate attempt to save the banking and financial system from collapse. Add the likely dumping of dollars by institutions and individuals around the world -- a trickle of which has already begun; people increasingly want anything other than depreciating greenbacks -- and it appears that hyperinflation is on countdown to liftoff. Those previously-sequestered dollars (trillions of them) will be flooding the market along with the new dollars created by the Fed, and the combination should be breathtaking. It isn't possible to know how quickly those sequestered dollars will be spent back into the system and repatriated, but the music has begun playing ever-louder for the big U.S. dollar musical-chairs event: no one wants to be the one left standing (with a hoard of worthless dollars) when the American fiat dollar reaches parity with the Zimbabwean dollar, or even just with the Yen. America is not the only nation suffering, as Bill Bonner reports in Inflation Goes Global. Bonner also describes why dollar inflation leads to inflation in other currencies. Amidst all this, TheStreet.com reminds us of the financial destruction that even "mild" inflation causes: Advice: Even Mild Inflation Should Scare You. If we should fear even mild inflation, how should we feel about the actual "non-mild" inflation we have right now? More importantly, how should we feel about what's coming? Google "German hyperinflation" for some clues. We have already seen that a number of respected commentators believe a major financial disaster of some type will begin sooner than 2010 -- perhaps as soon as this week (see comments from Fortis Bank above). As I've said before, timing and velocity of such things are never precisely knowable in advance; there are too many possible unexpected events along the way. But the current situation does suggest to me that a tipping point of some sort is very near, and I think real caution is advisable. As for how to protect yourself and your investments from all this (assuming that protection is even possible), Doug Casey has a few suggestions -- a very few; see final paragraph -- in The Greater Depression and What You Should Do About It. I'd add that most dollar-dependent investments (including bonds) and financial or consumer-oriented stocks seem a poor choice right now. Real goods (commodities of most types and precious metals in particular) that are always in demand and which cannot be inflated away to nothing seem a better bet. But the gambling metaphor is an apt one; plenty of surprises are likely in the coming months and years, and "sure things" sometimes aren't. Government help reliably makes things worse. 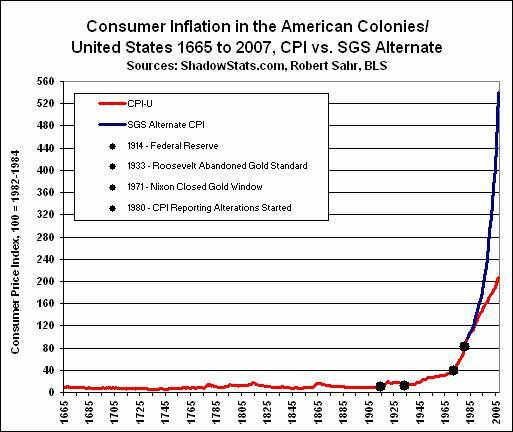 All of history shows this, and any intelligent political or economic theory (the Austrian School of economics, for one) describes why. My column The Worst Way to Do Anything: Why a Healthy World Requires Freedom from Coercion provides extensive detail on the topic, using examples most people are familiar with. With that basic understanding in mind, it is easy to guess what our masters have in store for us: more of what caused the problems in the first place. One reason we can count on "more of the same" is that the disaster most Americans are suffering from is not a disaster for the power elite: for them it is a huge and very profitable success. For example, the 9/11 terror attacks have made billions of dollars for corporations like Blackwater and Haliburton and dozens of others, and have spawned a glorious new era of political repression and entirely new government empires, including Homeland Security and the TSA . As the Neocons told us long before the 9/11 attacks (see reason number 10 in Top 10 Reasons for a New 9/11 Investigation), a major attack on this country -- a "new Pearl Harbor " -- was necessary to rally public opinion around their oh-so-important plans for taking over the Middle East . What luck! A bunch of Arabs hiding in caves decided to provide just such a provocation. The attacks of September 11, 2001 were a genuine horror, the resulting police state has been a nuisance at the least (and a terror in and of itself for those who know some history), and the two wars and occupations falsely justified by the attacks have killed over a million human beings, wrecked the infrastructure of both target nations, and put a $3 trillion-and-growing millstone around the neck of the American taxpayer. But see, that's just how it looks to the little people. In the Big Picture, as seen by Bush/Cheney and their friends in the War and Terror industries, the 9/11 attacks were a godsend. Likewise, those inflation-creating (perhaps hyperinflation-creating) bank and investment firm bailouts are a huge tax on the future earnings of ordinary Americans, but -- to put it plainly -- the bailouts are nothing short of free money (yipee!) to the corporations on the receiving end. Here again we see that being an Ordinary Person is not a good idea, at least not when coercive government is on the job. Adding to the coming Big Hurt will be even higher taxes, no matter who wins the White House. Time Magazine, the mouthpiece for the American oligarchy, is prepping citizens for the "more money for us, less money for you" era soon to come. Historian Gary North summarizes the situation this way in Old Keynesian Dogs, Old Fiscal Tricks: "We are heading into a great reversal. We are going to see rising taxes and a falling stock market." A more certain prediction is difficult to imagine. Yet another emergency that government plans to save us from is environmental degradation. Government help on the environment (and the gas crisis) has so far brought us the wonders of ethanol, in the form of mandates that have taken about a third of the corn crop out of the food chain and put it into our gas tanks, with no benefit to the environment whatsoever ' some say, with damage to the environment. The shortages and higher prices have brought suffering and starvation to the truly poor around the planet, but hey! -- That's not our problem. It has also helped raise food prices for ordinary Americans, but we've already pointed out that being an ordinary person isn't smart, so no surprise there. And this past week, we learned that those scary solar projects (the ones on federal land, anyway) have been put on hold for two years by the feds. At the news, oil- and coal-industry bigshots were seen weeping in the hallways of Congress. Thanks, government! I feel much safer now! Americans want help from their government, and (to paraphrase H. L. Mencken), the government is planning to give it to them, good and hard. The last three areas on my list (oil, metals, and other natural resources; food shortages; and environmental damage) will be discussed in Part 2 of this column.